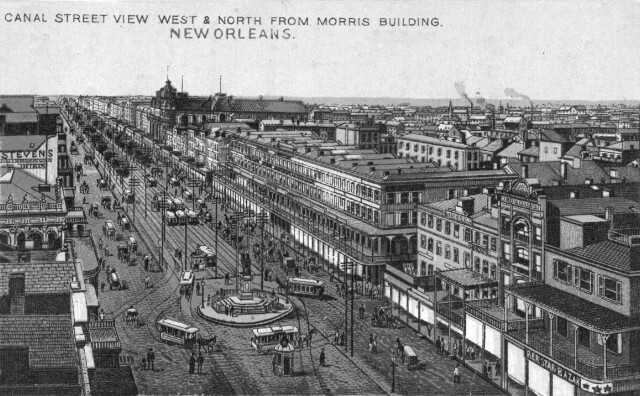 Here is an artist's rendering of the view from a vantage point in the Morris Building, one of the taller buildings on Canal Street, some time between 1883 (when Christ Church was demolished; note the absence of its steeple) and 1887 (by which date the light tower was built at the corner of Carondelet/Bourbon). He did not draw in the turntable of the Magazine and Prytania lines, on the near side (the river side) of the Clay statue. But he does give us a good view of the Orleans RR loop around the Clay statue. We also have a good view of the trees which are between the inner tracks and the outer tracks on Canal Street from the Carondelet/Bourbon intersection outward.